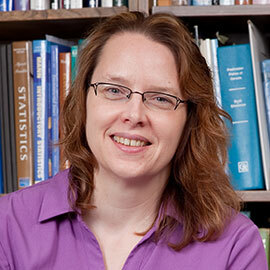 WATERLOO – The Senior Women Academic Administrators of Canada (SWAAC) has awarded Deborah MacLatchy, Laurier’s vice-president: academic and provost and acting vice-president: Research, with its 2015 Recognition Award. The award is given to a SWAAC member who has continually demonstrated innovative leadership in advancing the mission of, and achieving outstanding contributions to, their institution. As vice-president: academic and provost, MacLatchy oversees the strategic and operational management of the academic functions of the university, including the management of Laurier’s nine faculties, its departments and programs, as well as the library network. Her portfolio also includes services designed to support teaching and learning such as the Centre for Teaching Innovation and Excellence, as well as Recruitment and Admissions, the Registrar’s Office, Laurier International and Information and Communication Technology. In recognition of the award, SWAAC will make a $1,000 donation on MacLatchy’s behalf to an institution of her choice, in the form of a contribution to an endowment or fund that supports students, or to a registered charitable organization supporting educational initiatives. She will use the donation to support the Laurier Women in Science and Leadership Award, which she established as Laurier’s first female dean of science. The presentation will be made at the annual SWAAC conference in Toronto on May 1. Last year, Laurier’s Board of Governors appointed MacLatchy to a second five-year term as vice-president: academic and provost. During her tenure, MacLatchy has played a lead role in many initiatives, including the establishment of new undergraduate and graduate degrees, development of the multi-campus governance framework, the launch of the Laurier Institute for Water Science and the Laurier Centre for Women in Science, and the advancement of the university’s research agenda. A distinguished zoologist with extensive experience in research, teaching and administration, MacLatchy served as dean of Laurier’s Faculty of Science from 2007 to 2009. MacLatchy was recently named one of Canada’s Most Powerful Women for 2012 in a Top 100 list compiled by the Women’s Executive Network (WXN), and is past chair of the science directors of the Canadian Rivers Institute. In addition to her management role at Laurier, she is funded by the Natural Sciences and Engineering Research Council of Canada (NSERC) as well as through industry and federal, provincial and territorial infrastructure platform grants. She has published over 80 peer-reviewed publications in her field. She is a 2005 recipient of an NSERC Synergy award for partnerships along with Irving Pulp and Paper Ltd. and Environment Canada.